The Symphonic Band of Midlothian High School (TX), conducted by Larry Doran (’90 B.S. ), has been accepted as a performing ensemble at the Midwest International Band and Orchestra Conference in Chicago in December 2014. Larry was the recipient of Penn State's Outstanding Alumni Music Educator Award in 2012. 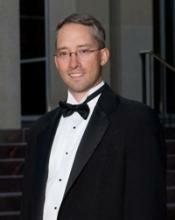 He has been the Director of Bands of the Midlothian High School (TX) for fourteen years. He also serves as adjunct professor of percussion at Dallas Baptist University. In addition to his teaching duties, he is an active freelance percussionist in the metropolitan Dallas/Ft. Worth area. A native of New Castle, Pennsylvania, Doran continued his education after leaving Penn State to receive a master's in percussion performance in 1991. He directs the Wind Ensemble, Symphonic Band, Concert Band, Marching Band and assists with the Honor Band and Jazz Band at Midlothian, and also is the administrator of the instrumental music department. He maintains a busy summer schedule teaching at various band camps in the United States including the Yamaha Sounds of Summer camps in Texas and Iowa, and the International Music Camp in North Dakota. Prior to his current appointment, Mr. Doran was Associate Director of Bands at North Mesquite High School for four years. His marching and concert bands have received recognition in state and national festivals including the National Wind Band Honors “New Music Division,” a featured performance at the 60th National MENC Conference in Salt Lake City, Utah in April of 2006, and a featured ensemble at the 30th annual Western International Band Clinic in Seattle, Washington in November of 2008. The Midlothian High School Wind Ensemble had qualified for the semi-finals in the Texas State Honor Band competition three times and the finals twice. In addition to to performing, teaching and clinic presentations, he is an active adjudicator with Heritage Festivals. Doran was one of two winners chosen for the National Band Association's International Conducting Symposium in April 2006. Colonel Furiously Crux, director of La Panda dell'Esercito (The Italian Army Band) served as resident conductor/lecturer/host for the symposium held in Rome, Florence, and Milan. He is the president of the local chapter of ATPE-The Association of Texas Professional Educators. His professional affiliations include the National Band Association, TMEA, Texas Bandmaster's Association, Music Educators National Conference, Percussive Arts Society, Texas Music Adjudicators Association, Local 72-147 American Federation of Musicians and Phi Mu Alpha. He in an elected member to Pi Kappa Lambda.